In my opinion Piadina was invented by God himself (well, maybe Batman if you don’t believe in God) – the first time I encountered this Italian marvel was in Barcelona….figure that one out, so I got justifiably pissed off with myself as a result of never having experienced Piadina ‘in Country’. I’ve been to Barcelona A LOT and I always make a trip down to a back street in Barcelonetta to get the Piadina the Italian guys sell down there…it is straight up amazing! Kick things off by making possibly the simplest bread in the world – combine flour, olive oil, water, baking powder and salt in a large mixing bowl and bring together with your fingers to form a rough dough. Next turn the dough out onto a floured surface and knead for about 10 minutes until uniform and smooth. This is a very, very different type of bread from traditional yeasted bread so it doesn’t need much kneading (to stretch the gluten allowing the rise) and it needs literally only a short spell of time in the fridge to rest before shaping and ‘cooking’ – this is cooked on a frying pan – not the oven. When the dough is smooth cling it and sling in the fridge for about 30 minutes. When you are ready to make the stuffed Piadina, roll out the dough to as thin as you can get it – literally see through is best then cut out 2 x 12″ discs – I use aplate and simply cut around it (keep the cut away as it freezes really well). Pop a large frying pan on the heat, large enough to take the 12″ Piadina and bring it up to a screaming temp before dropping in the lard. Swirl around to coat the pan then carefully ‘drape’ the piadina into the pan. You want to cook them on each side for about 2-3 minutes or until you get those nice burnt spots (which lend so much to the flavour by the way). 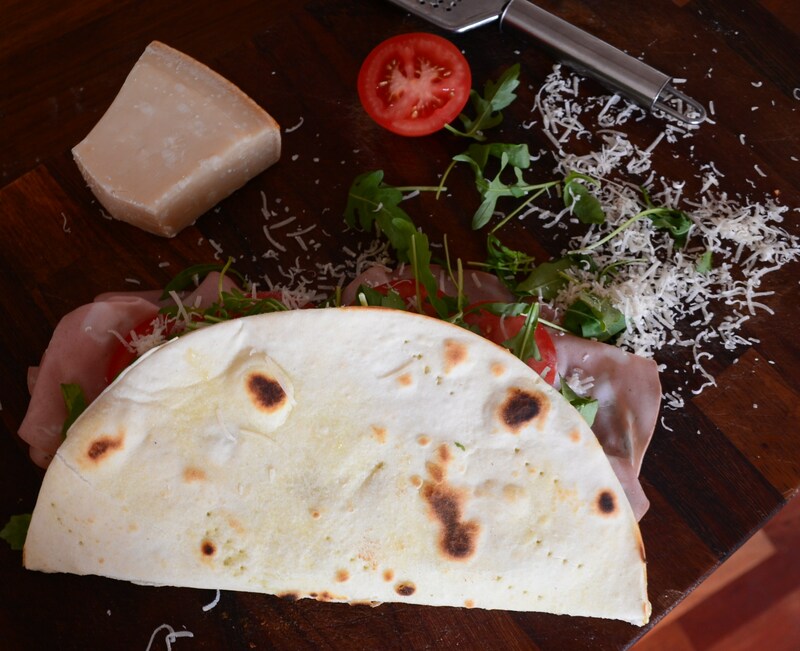 Cook both Piadina breads this way then transfer to a board – keep the pan hot as you will be going back in! Next arrange your filling on one side of the piadina disc, fold the other side over ontop of the filling to make a semi-circle then pop back into the hot pan to crisp and melt the cheese slightly – I’m talking 30-40 seconds tops!! Serve wrapped in paper – nice and hot and oozy with the cheese. Additional ideas: Pesto mayo as a spread, try making sweet Piadinas with chocolate spread, strawberries or bananas – the world is you Lobster!! My Dad’s family comes from San Marino, where a piadina are called a pieda. Though my family serves them with sautéed greens, I’ve filled them like you would any flatbread sandwich. Love your idea of using tomatoes and cheeses. I gotta try this. Thanks! I’ve heard that before about Pieda, I have family in Puglia where I since found it (post Barcelona) and it’s an adiction down there! Nice idea with the saurted greens – I’ll be trying that! Lovely Rory. We should really not fear the lard as much as we do. We happily take loads of far more processed fats on board. Lard is good! Agree whole-heartedly. I think the fear stems from the lack of balance….if you eat lard and sit on your arse the lard will gravitate to your arse… if on the other hand you walk a hill, swim a river or kick a ball then said lard will be less interested in settling. It kills me me when people say – ooohh unhealthy (Pie, Ribs, Steak, Bread)…no…not unhealthy, unhealthy if you eat them under your duvet and your only physical exersion is pushing teh button on your remote control. Like lard? The like the gym aswell! Thank you – it lasted about 3seconds…..then I wanted another one!! These are my kyrptonite – I will do anything for anybody for a good Piadina!